For the 40th jubilee, Tom & Carol Duffy, first Worldloppet Masters in history, are thinking back to 1980. During the #worldloppet40 jubilee week we are celebrating 40 years of skiing around the world. The 7500 bibs for the 46th Marcialonga, on the 27th January 2019, are already taken. Alexander Panzhinskiy, Russian cross-country elite skier & Olympic medalist has good words about Fossavatnsgangan. The New Zealand member of Worldloppet, the Merino Muster, welcomes the Worldloppet skiers with special travel packages. Around 1000 popular skiers came together for one last time in 2018’s Worldloppet winter at Isafjordur, Icland, at the Fossavatnsgangan. Tomorrow we start the final show on snow this Worldloppet winter, in Isafjordur/Iceland at the Fossavatnsgangan. Today you have the unique chance of getting your starting place in 2019’s Marcialonga. 100 bibs are offered for a special price. Every week worldloppetTV is showing you the hottest stuff out of the world of marathon skiing. Today watch episode #17. This weekend the Birkebeinerrennet in Norway celebrated its 80th anniversary with a great nordic experience for the participants. Two more Worldloppet races are waiting this winter, one of them is going to take place tomorrow for the 80th time in Norway: The Birkebeinerrennet. 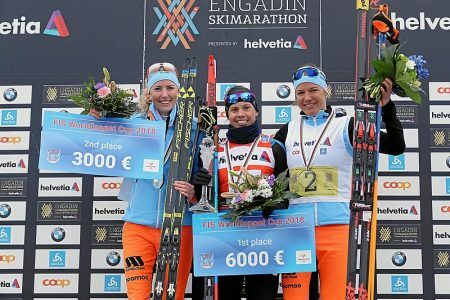 The FIS Worldloppet cup final stage, the Engadin Skimarathon showed Swiss home victories, Dabudyk winning her 3rd title & Perrillat as new FIS Worldloppet Cup Champ.